This August I had the incredible opportunity to spend two weeks touring Morocco on a project with Best Travel Morocco. I visited mosques & climbed ruins; I spent too much money shopping in the medinas; I ate tagine until it came out my ears; and yes — I rode a camel (very briefly). And I want you to do all of this, too. 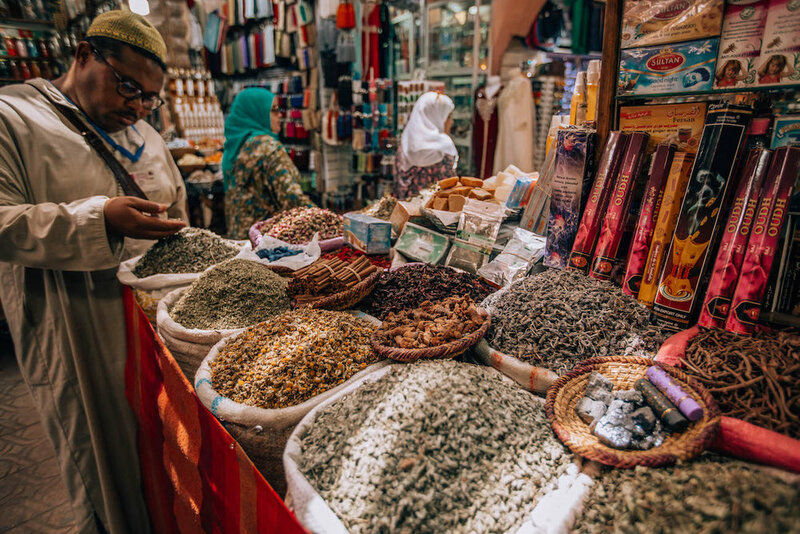 This Morocco Travel Guide will tell you where to go, what to see & do at each destination, as well as some helpful tips and logistical details to make your trip just a bit easier. Personally, I expected shaggy rugs; I expected colorful mosques; I expected tagine; I even expected camels. But I never expected to fall in love with Morocco as much as I did during my two week jaunt around the country. I also certainly didn’t expect Morocco to be quite so vast and diverse. Of course, most travelers know to add the famous Imperial Cities like Marrakech and Fes to their itineraries. But what about blue-painted cities? Hippy beach towns? Small indigenous Berber villages in the middle of the Sahara Desert sand dunes? Trust me, you won’t want to miss those either. Morocco is huge and requires a lot of driving, so give yourself enough time to see it in all of its vast, diverse glory. Even with two full weeks and a jam-packed schedule, I still wished I had more time to see more. But I’d recommend allotting no fewer than 7-10 days to explore. You’ll need at least 10 if, in addition to the major cities, you also want to visit some of Morocco’s quirky little towns or spend time in the Sahara Desert. Made famous by the 1940s drama starring Humphrey Bogart, Casablanca now hardly resembles the romantic, French-inspired black-and-white scenes you’ll see in the film. Today, Casablanca is most notably an international financial hub, scattered with nondescript grey office buildings and apartments. But there’s also a good chance you’ll fly into and out of Casablanca for your trip to Morocco. So when you do, take the time to explore some of the history the still remains in this modernized city. The largest mosque in Morocco, and the second largest in all of Africa, Hassan II Mosque is by far one of the most impressive landmarks in Casablanca. It’s built partially over land partially over the Atlantic Ocean, with a 60-stories-hight minaret topped with a laser pointing toward Mecca. But it’s not without its controversy. The mosque was commissioned by King Hassan II as a sort of 60th birthday present to himself. But Morocco lacked the government funds to finance the ambitious project, so mandatory “donations” were collected from citizens — rich and poor, willing and unwilling. It wasn’t completed until the 1990s, after years of construction. So while it’s certainly impressive and draws visitors from around the world, Hassan II Mosque isn’t as well-received by some Moroccan citizens. Try to visit Hassan II Mosque at sunrise, just before the massive plaza fills up with worshippers coming for morning prayers. You’ll have the place to yourself, and you’ll be able to watch the white granite columns and archways turn from pink to orange to fiery yellow, casting spindly shadows and reflecting off the mosque’s glass windows. It really is a sight to see, if not just for the experience of standing in a silent, pristine, massive open space in the midst of a busting industrial city. Be sure to also step inside the mosque between prayer times to see the beautiful interior of the mosque. 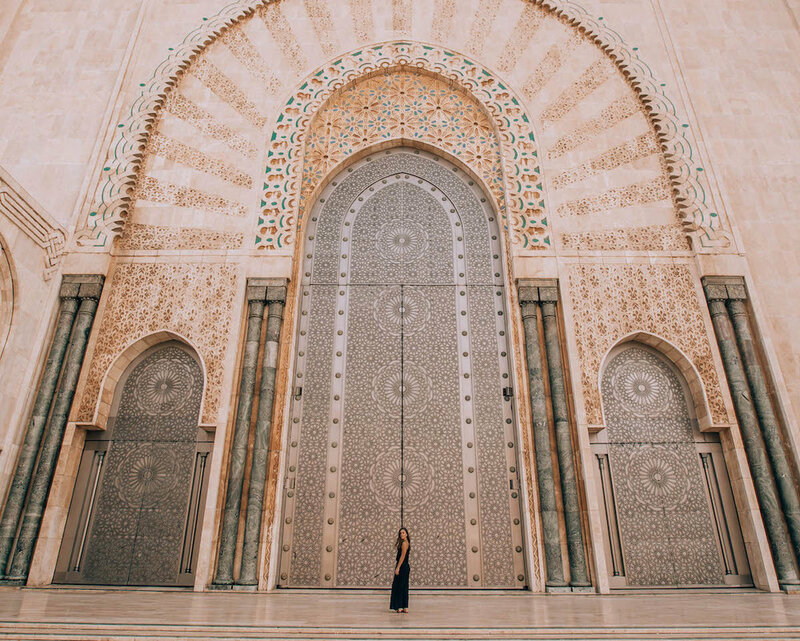 With carved wood spiral staircases, grand chandeliers, intricate colorful mosaics, and the most magnificent doors you’ll ever see, Hassan II’s interior may even rival the exterior’s impressive geometric architecture. White-washed houses serve as a serene backdrop to the hustle and bustle of the Casablanca Medina. This medina certainly doesn’t rival the magic of the Marrakech medina, and it might not be your best bet for picking up unique Moroccan souvenirs, but it’s still worth wandering through if you have the time. You’ll still find the typical windy streets, little cafes and restaurants, and tree-filled gardens, plus tons of locals going about their daily lives. Morocco’s capital city and a seaport town, Rabat shouldn’t be missed if you have interest in Moroccan history. 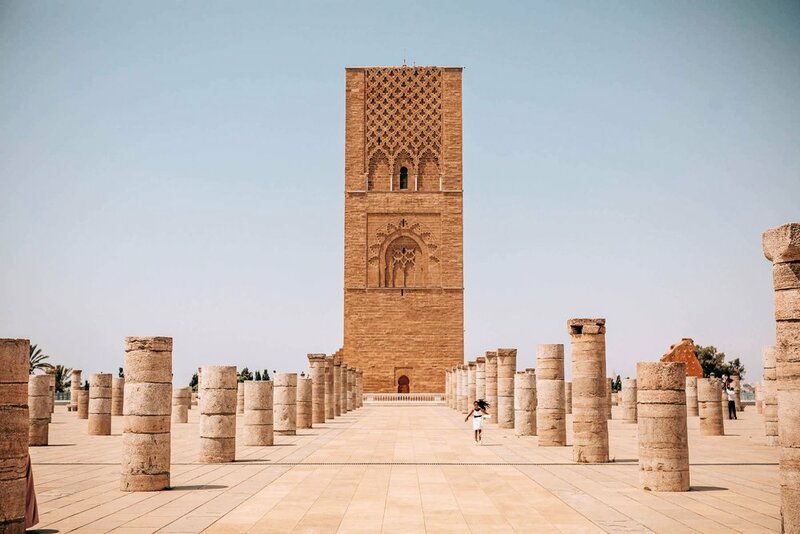 Here you’ll find influences from the city’s Islamic and French-colonial heritage, and a much less “touristy” feel from other of Morocco’s Imperial Cities. Be sure to spend some time wandering through the ruins at Chellah, a medieval fortified Muslim necropolis. It was initially established as a Greek trading emporium, then transformed into the ancient Roman colony of “Sala Colonia,” and finally conquered by North African Muslims which renamed the site “Sala” and used it as a royal burial ground. So, basically, a lot of history lives here. Visit early in the morning to get cooler weather (there is very little shade among the ruins) and fewer visitors. These landmarks are conveniently located next to one another, so you can easily visit both in one stop as you pass through Rabat. Hassan Tower appears, for good reason, an odd sight. The site is essentially a skeleton of a mosque, and the tower itself is the minaret of an unfinished mosque. When built in the 12th century, it was intended to be the largest minaret on the largest mosque in the world. But construction ceased when the commissioning king died, and the tower never reached more than about half its intended height. So all that now stands is a large red sandstone mosque, overlooking a plaza filled with the columns of a never-built mosque. The white walled Mausoleum contains the tombs of the Moroccan King and his sons, King Hassan II (remember the Hassan II Mosque?) and Prince Abdallah. With a green-tiled roof, intricately carved domed archways, and views onto the Hassan Tower, it’s a great place to grab some scenic photos and appreciate the modern Alaouite dynasty architecture. This “city within a city” was built in the 12th century but renovated many times throughout the centuries that followed. Even today, if you pass through the kasbah’s walls to explore, you’ll see modern artistic touches from the residents who still inhabit the kasbah. The fortress is home to narrow streets of white-washed and blue-painted houses, ocean views, and the grand Andalusian Gardens, making it a quaint and scenic place to spend a quiet afternoon. Although Fez has a bit less of the glamour of Marrakech, I find this Imperial City to be highly underrated as a cultural and creative hub. 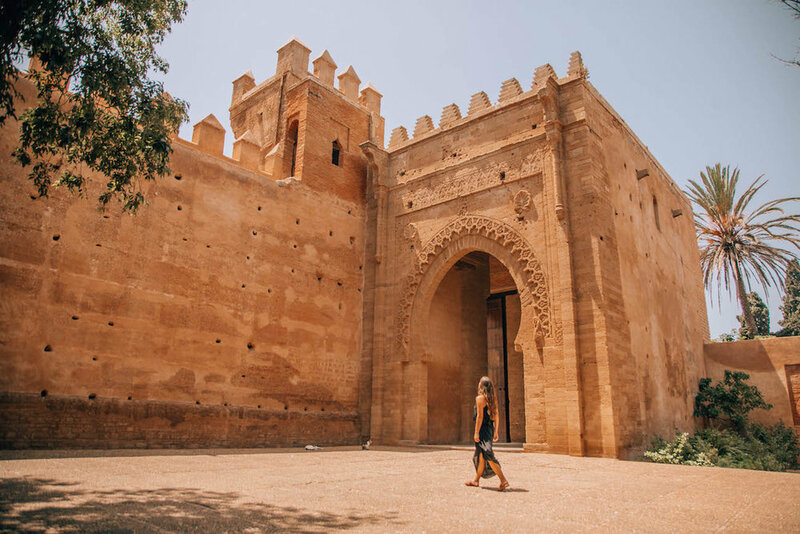 You’ll find the roots of Moroccan culture inside and around the city of Fez, including sites evidencing the country’s diverse ancient geopolitical history. 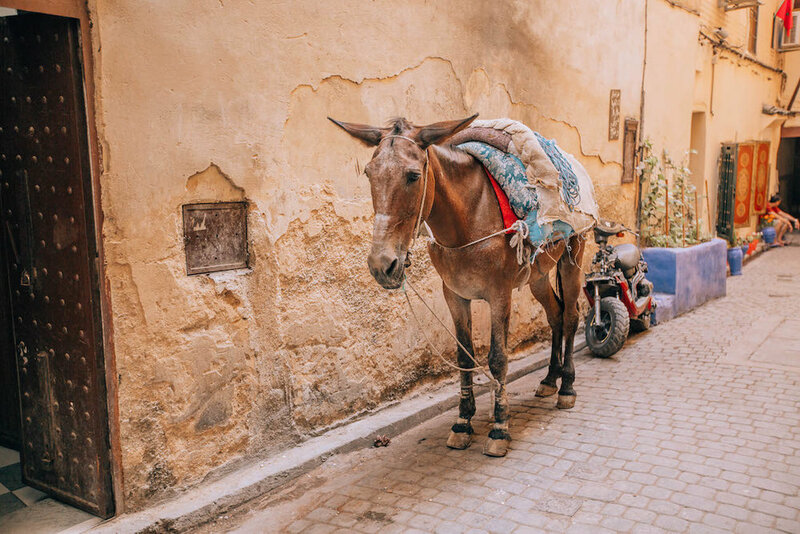 While Morocco might be where you go to purchase handicrafts, eat world-renowned cuisine, and experience modern Morocco, Fez is where you go to see where it all started. The Fez medina has a completely different feel from those in cities like Casablanca and Marrakech, but that’s exactly what makes it so wonderful. Here you’ll find the same windy cobblestone streets (if not a bit more narrow than the usual) lined with multi-story residences as in other Morocco medinas, but the shops, bakeries, mosques, and pedestrian life feels about three-hundred years older. You can find weavers who still hand-dye their own yarn in buckets on the roof, bakers who still throw dough into massive, dusty stone ovens partially submerged in the earth, “cafes” that are no more than baskets of fruit and stools who will prepare a breakfast per your preferences with their ingredients (travel hack: I recommend asking one to fill a traditional Moroccan pocket bread with bananas, honey, and almond butter — that might have been the most delicious thing I ate in Morocco and the shop owner, who’d never tried it before, seemed to agree). You’ll also find the famous tanneries here (see below), as well as iconic colorful mosaic doors and some of the most famous mosques in Morocco to which families from all over the country make pilgrimages. For a break from Fes’s chaotic city streets, simply walk through the Blue Gates into a world of pedestrian streets and charming eateries. It’s far from peaceful, but without vehicle traffic and with the many beautiful cafe terraces scattered throughout, you’ll feel a bit removed from the more stressful city setting. Be sure to stop at Rainbow Street, a narrow alley aptly named for its brightly painted walls. The alleyway is jam-packed with funky shops and galleries, as well as plenty of opportunities for a unique photo. Wind down in the evening by snagging a seat on the rooftop terraces of one of the restaurants near the Gates. Order some delicious tagine, a carafe of wine, and enjoy an evening soaking in all the sights, sounds, smells, and tastes of Fez. Arrive early to ensure you find a seat with the best views of the twinkly city and distant mosques. Although not the most popular stop while in Fez, the centuries-old mellah, or walled Jewish Quarter is well-worth a visit. You’ll be able to learn a bit about the centuries-old history of Jewish integration in Morocco, and find some ancient relics preserved by locals in their shops and museums. For a fascinating story of the history of Jewish people in Morocco and, namely, the city of Fez, read this NY Times article. Moroccos is famous for its leather products, and its here in Fez that you’ll be able to witness the behind-the-scenes production process. The tanneries consist of a courtyard of clay basins, filled with dies in which freshly skinned leather soaks and then is stretched to dry in the sun (it’s amazing to watch, but be warned: it smells pretty awful here). Surrounding the courtyard are several multi-story residences, as well as leather shops with viewing terraces to watch the activity below. You can find probably the best quality leather products in the country within the Tanneries’ shops, along with great prices and wonderful stories of human entrepreneurial spirit (most shop owners started as a leather laborers in the courtyard below, and worked their way up to become business owners). From palaces and mosques to forgotten fountains hidden in dusty alleys, you’ll find colorful mosaic artwork all throughout Morocco. Because Islam historically did not permit the depiction of people in its artwork, pottery and mosaics became the popular medium of creative expression both within religious sites and without. A visit to the Mosaic & Potery Cooperative in Fes will surely grow your appreciation for this painstaking labor and the masterpieces it creates. Here you can watch the entire process unfold before your eyes: from firing and painting the clay, to cutting and shaping individual pieces, to laying out intricate designs (color-side down! ), and finally to assembling the pieces into pots or fountains or dining tables. It’s so impressive to see and to learn about what each design signifies. There’s also a pretty sizable shop where you can purchase pottery and mosaics to take home. Be aware that you won’t find the lowest prices here, so if you’re on a budget, buying at a smaller village shop might be a better option. But if you’re after the highest quality and widest selection of pieces, then this is your place. Fez is scattered with crumbly ruins that beckon history buffs and photographers alike. In my opinion, the ruins are best explored at sunrise or sunset, because, as is in the nature of ruins, you won’t have any roofs overheard or shade from trees. The Marinid Tombs, situated on a hill overlooking Fez, consist of a large and impressive ruined wall, surrounded by stretches of ancient graveyard. These ruins are believed to date back to the 14th century when the Sunni Muslim Marinid dynasty ruled Morocco, but because they are so ill-preserved, the site’s precise historical roots remain uncertain. Just outside of Fez is Volubilis, an ancient Roman city and UNESCO World Heritage Site. It’s a testament to Morocco’s very international geopolitical roots, and even has a museum on site to give you some interesting background on the ruins. Volubilis is located about a 1.5-hour drive (around 60 km) outside of Fez. A artist’s paradise, it seems as if no piece of Marrakech is left untouched by the creative energy pulsing through its streets. It’s your destination for unique Moroccan handicrafts, luxury accommodations, and beautiful cuisine. You’ll also find the extremes of both chaos and relaxation in Marrakech, so be prepared for your senses to be working in overdrive while here. I hope you’ll love it as much as I did. Perhaps the most famous destination in Marrakech, this medieval medina is really the heartbeat of the city’s creativity. Packed with mazes of shops, each showcasing glimmering golden lanterns or fragrant spices or colorful hand-woven rugs or carefully crafted leather goods or a number of other local handicrafts, you could spend days getting lost (and emptying your wallet) in this medina. Be prepared to haggle a bit to get a fair price for your goods, and don’t be afraid to shop around before committing to a particular wood carving or woven pouf. Bring cash, and keep your belongings and valuables secure while walking around. And as a final tip, when packing for Morocco, I recommend throwing in a soft & compact piece of empty luggage (or, hey, just buy a new leather duffel in the medina) that you can fill with all your treasure and bring home. You won’t be able to visit Marrakech without at least passing through this massive public square in the old city. But give yourself time to wander and soak this utterly chaotic Moroccan landmark, which really comes alive at night. You’ll find food stalls, street performers, and souvenir vendors all packed into the square to keep you entertained for hours. Be aware of your belongings as this area is teeming with pick-pocketers, from adults to (sadly) children as young as three and four years old. And be prepared for more aggressive practices from street performers, who may demand money even if you so much as pass by their territory — you certainly are not obligated to give them money, but be prepared to give a stern “no” even if they approach and appear angry. If you’ve spent any time on Instagram, you’ve likely seen some of these glamorous accommodations, with distinctly Moroccan architecture and decor, float through your feed. And Marrakech in particular is filled with some of the most beautiful riads, or traditional Moroccan homes with the iconic tree-filled central courtyards. 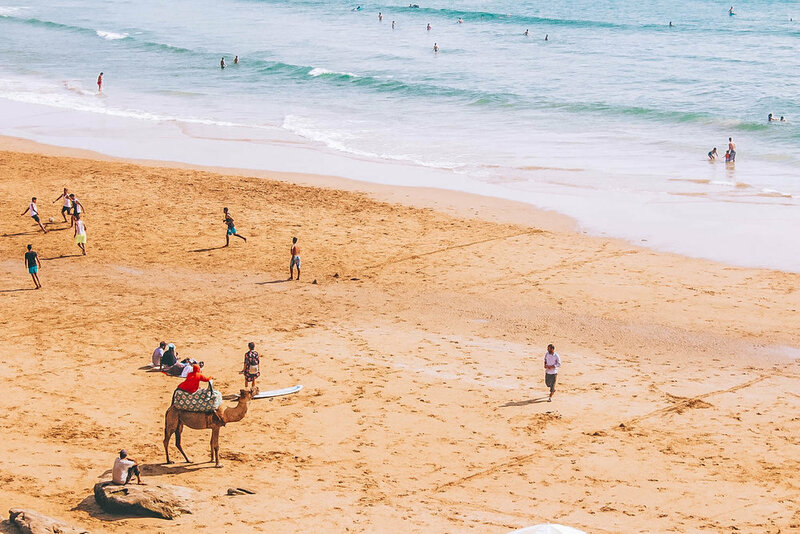 Whether you’re an art, architecture, design, or culture fanatic, or if you just want to live like royalty for a while, a pretty Moroccan raid is the place to be. Although many allow non-guests to visit or dine at the riad for a fee, the best option is to book a room in one (or a few) during your stay in Marrakech. In the nicer riads, expect a lush central garden or pool, breakfasts and tea in the courtyard, the utmost hospitality, and rooms decorated like stunning Moroccan palaces. It’s not difficult to find a beautiful riad for a reasonable nightly rate, so don’t be deterred by their luxury appearances. Riad de l’Orientale, Riad Maialou, and Riad Irhalen are three lovely options with rooms and suites ranging from about 60 Euro to 150 Euro. Often overlooked on a Morocco itinerary, Essaouira is a sort-of-hidden gem. To be honest, this little seaport town felt nothing like the rest of Morocco and nothing like what I expected to experience in Morocco. Think: chilled beach vibes, narrow cobblestone streets lined with white and blue homes, vagabond street performers, and some of the tastiest, fresh-off-the-boat seafood you can find. There are tons of little hotels and charming Airbnbs in the old city. Or, if you want to get out of the bustle, stay nearby at family-run Riad Zahra where you’ll find charming Spanish-inspired accommodations and perhaps the best seafood dinner in town. If anything, Essouaia gives off vibes more similar to Positano or Santorini, especially in its old city. Here you’ll find windy cobblestone streets lines with handicrafts shops, art galleries, and restaurants and cafes serving tasty international and local cuisine. It’s the perfect place to pick up some souvenirs without the chaos and stress of big city medinas, to take a relaxed cooking class, or to enjoy drinks at a rooftop bar at sunset. These oceanfront ramparts, dotted with brass cannons and overlooking the rocky seaside are a must-visit while in Essaouira. Built in the 18th century by European architects, you’ll feel even more like you’ve been transported far away from North Africa as you wander these stone walkways. The area is filled with travelers and locals alike, and it’s a lovely place to watch the sunset behind the ocean horizon. Essaouira is perhaps best known for its sprawling, sandy beach. You’ll find beachside cafes where you can enjoy lunch, and chairs and umbrellas (although not so many bikinis) on the sand if you want to catch some sun. If leisurely beach days aren’t your thing, the strong “Alizée” trade winds make it a popular spot for surfing, kitesurfing, and windsurfing. Just next to Essaouira’s old city is its iconic (both in its sea of blue boats and in its pungent, fishy smell) sea port. Early in the morning or in early evening, you can visit to watch the fishermen arrive back to the docks to unload their catches. I prefer the sunrise vibes, when it’s quiet and peaceful and you’ll likely be the only tourist there. In the evening, you can pick out some fresh seafood (try something new!) and have it grilled right in front of you for a tasty snack. I can’t even put into words how much I loved the three days I spent in this little town in the Sahara Desert. Merzouga is situated near the Algerian border, and is the perfect base from which to experience the culture and beautiful landscapes of the Sahara. You’ll find a massive expanse of sand dunes here, making you feel like you’re worlds away from civilization. But in fact, Merzouga is fairly easy to access, and has plenty of accommodations to make it an easy add to your Morocco itinerary. Stay at least two nights to get the full experience and to give yourself enough time to unwind. On most Sahara Desert bucket lists is a stay at a luxurious desert camp. Planted in the middle of the dunes, these retreats are like oases in themselves: tiny communes dotted with white tents and colorful Moroccan rugs covering the sand. Sleep in giant canopied tents, complete with running water, plumbing, electricity (but note that, as you are in the middle of the Sahara desert, resources are always limited, so be patient and respectful), and interiors decorated like Moroccan palaces; dine on delectable gourmet meals, prepared right there in the desert; spend evenings sitting around a campfire under the starry skies; fall asleep to the lull of grunting camels and Berber drum circles echoing outside. I stayed at Sahara Stars Camp and had a wonderful experience, even if we did happened to get stuck in the biggest rainstorm Merzouga has had in over a decade. If you are looking for a similar experience but from the comfort of a hotel with solid walls, I recommend family-run Auberge Takojt. Alright, despite the fact that I find camel rides to be way more uncomfortable than they’re worth, I recognize that for so many travelers, a trip to Morocco without a camel ride is complete nonsense. But while some desert camps will have you travel for hours (in the blazing sun or during a sand storm, might I add) to their campsite by camel, I recommend foregoing this option at all costs. Take the 4-wheel-drive vehicle and thank me later. Instead, schedule a camel caravan with your desert camp for your first morning. Early mornings will be much more pleasant than a ride under the midday desert heat, and you’ll get to see the beautiful desert sunrise. Also, by scheduling it for your first morning, if weather is less-than-desirable (and believe me that sand storms are not uncommon in the Sahara, and you do not want to be stuck on a camel during one), you can reschedule for the next morning. Okay guys, this was really, really fun. Zipping through the vast and empty sand dunes on ATVs with your friends is a blast, and a great way to add a bit of excitement to your leisurely Sahara retreat. It was actually my first time ever driving an ATV, and I can’t think of a more epic introduction to it. Most desert camps can help you schedule this and provide transportation to and from the ATV company in town. I hope you’ll learn as much as possible about the indigenous Berber (or “Amazigh,” meaning “free people”) culture while in Merzouga, including their tumultuous history as desert nomads, fascinating nomadic way of life, and tolerant world-views. Check out this post for more details on Berber culture. In addition to Berber culture, other ethnic minority groups inhabit this region of the Moroccan desert. One such group is the Gnawa people, renowned for its hypnotic, trance-like music. You can visit their community in Merzouga and watch a musical performance, and even pick up a CD to take these haunting tunes home with you. You’ll also find cities of brown mud homes and kasbahs, surrounded by oases of green palms, with a giant river gorge cutting through the region. It’s a great area to pick up souvenirs, go hiking, and step foot on some of Morocco’s most ancient sites of civilization. But whether it’s for the shopping, the hiking, the history, or to fulfill your movie-buff dreams, this an area you won’t want to miss on your Moroccan adventure. Game of Thrones fans, rejoice! 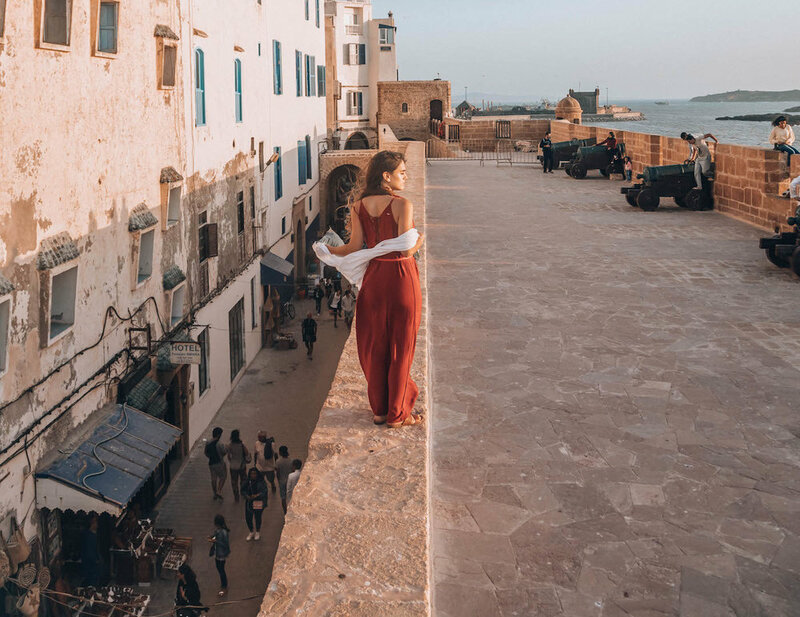 This city — and in particular, the ksar (walled town) of earthen dwellings — is iconic not only for serving as the setting of the famous TV series and numerous famous movies, but also as an impressive display of southern Moroccan architecture. Walking through the town of reddish brown mud homes all clustered on a matching brown hillside truly feels like stepping into an ancient time capsule. I recommend waking up early to wander the streets before crowds of tourists arrive, and find a traditional rooftop terrace cafe overlooking the town to greet the day with mint tea and pastries. You’ll find some beautiful Moroccan rug co-ops here, so if you’re hoping to head home with one (or a few) in tow, this is the place to spend some cash. The weavers in the area are some of the most skillful in the country, and you’ll often get better prices than in the big city medinas. This breathtaking mountainous region, located just outside of Ait Ben Haddou, is especially famous for it’s scenic driving route. As you pass through the Dades Valley, you’ll encounter spectacular viewpoints of the massive Dates River that snakes though the mountains. Eventually, you’ll find yourself in neighboring Todgha Gorge, where the water levels out into a flat, public riverbed to which locals flock for leisurely afternoons by the water. You’ll want to stop the car and walk around, dip your toes in the cool river, people watch, and maybe even have a picnic by the riverside. Nearby you’ll also find what is easily the most iconic stretch of road in this region of Morocco. The Dades Valley Switchbacks offer a spactacular view of the gorge and river below. Be sure to stop at the top of the hill for a photo of the famous switchbacks! For a budget accommodation, stay at Le Chateau du Dades, with breathtaking patio views overlooking the Dades River and a plentiful breakfast buffet. For more of a splurge, Dar Blues is possibly one of the prettiest hotels I’ve ever seen, artfully decorated in traditional Moroccan Berber decor, and surrounded by gardens of olive and fig trees, with shaded terraces overlooking the nearby creek. Most likely, you’ll at least drive through the Atlas Mountains at some point during your road trip around Morocco. This spectacular mountain range stretches 2,500 km through Morocco, Tunisia, and Algeria, with its highest peak reaching an altitude of 4,167 meters (Toubkal Peak). Much of Morocco’s Atlas Mountains are a bit desolate, scattered with stretches of wildflowers, lush pine forest, palm-filled oases, and quaint villages. Along with indigenous Berber communities, you also may find wild animals like macaques, leopards, badgers, gazelles, sheep, and vipers who call this region home (species including the Atlas bear, Barbary lion, North African elephant, and North African aurochs once inhabited the Atlas Mountains but now are sadly extinct). If you have the time and the interest, plan a day or multi-day hike in the Atlas Mountains with a local guide. Some of the most popular hiking routes include Toubkal (the Toubkal peak is the highest in North Africa and takes a couple of days to summit, or 4-5 days to complete the Toubkal Circuit, but you can find shorter day hikes around Toubkal National Park), Aroumd (a more leisurely trek near the town of Imlil), M’Goun Massif (with treks ranging from short and easy to the six-day M’Goun Circuit, which takes trekkers through lush valleys, lakes, rock formations, and villages), and hikes near the Todgha Gorge and Dades Gorge. Known for its iconic blue-washed homes with red tiled roofs, the little town of Chefchouraen is a true desert gem. It’s about a 7-hour drive from Marrakech, but it was one of my favorite stops in Morocco and was absolutely worth the trek. Stay for at least two nights to really appreciate the peaceful and charming Chefchouaen vibes. But don’t expect to be very active — the best way to do Chefchouaen is to not make plans, and spend your days getting lost within its windy maze of cobblestone streets, photographing the beautiful blue houses and adorable kittens, and dining under twinkly lights strung over quaint courtyards. You’ll almost feel like you’ve been transported to a small Italian village, but for the smells of tagine and the artisans selling Moroccan rugs and the fact that basically everything is blue. Catch sunset from a neighboring hill and watch the city begin to light up, house by house, as evening calls to prayer echo through the mountains. The lookout point at the Spanish Mosque is spectacular but also incredibly popular, so if you want more privacy just hike up or down the hill a bit to get away from the crowds. I get it. You’ve been dreaming of this trip for ages, and with so many places to see and so much to do, you don’t want to miss a thing. Here are some tips that made my trip easier, or things I wish I would’ve known before boarding the plane. Perhaps the most important thing to know when preparing for your Morocco trip is that you’ll be doing A. LOT. OF. DRIVING. The country is huge (446,550 square kilometers, to be exact), and about as long as the entire north-to-south length of the United States. If you want to see a lot, expect to be in the car a lot. With that in mind, I recommend preparing with motion sickness medication, healthy snacks (you’ll find tons of fruit vendors along the roads, so picking up a bag of figs or pre-peeled cactus fruit is a great option! ), pillows for naps in the car, and lots of pre-downloaded movies. Personally, I wouldn’t recommend driving yourself around the country, as much fun as a two-week road trip may or may not seem. Not only can some of the terrain become challenging for those unfamiliar with the climate, but it can be remarkably easy to get lost, especially when driving through the desert. Rather, save yourself the stress and time that you’ll surely spend getting very lost, and hire an experienced local driver with a well-air-conditioned 4-wheel-drive vehicle. This is specifically for women traveling to Morocco, because there is too much (mis)information about what to/not to wear. Personally, I think it’s important to understand local etiquette and do what’s possible to align with the norms, both in the interest of respecting local culture and avoiding the misery of constantly standing out like a sore thumb. But to be honest, I rarely found clothing norms to be quite as conservative as many people made them out to be. Generally, I wore long sleeveless dresses, and would bring a shawl to cover my shoulders in more rural areas if I thought it might be more respectful (although, if asked, my guide would brush off my concerns and say the shawl wasn’t necessary). In the bigger cities like Marrakech and Fes, it won’t be uncommon to see women wearing knee-length dresses or shorts, and foregoing head-coverings. That being said, you’ll likely experience more stares/cat-calling/harassment in these cities, which I guess is typical in most urban cities around the world. If that bothers you, keep a male friend close by and/or dress more conservatively. In the desert, you can pretty much wear whatever you want (within reason). It can get very hot and above-the-knee shorts are generally fine. But I recommend leaving them at the campsite if you plan to go into town to visit some of the ethnic communities. At the beach, it’s more acceptable to wear shorter sundresses and shorts, but I still wouldn’t advise it — women who dressed like this still really seemed to stand out, and received lots of stares. At the main beach, you likely won’t find women in swimsuits (men only wear swim suits, and women are fully covered), but if you stay at a resort with a private beach, you’ll probably have more freedom to show some skin. But maybe leave that super skimpy bums-out bikini at home. Morocco uses the Moroccan Dirham (MAD) as currency, and its current exchange rate is about 10 MAD to 10 USD (if only foreign currency conversion could always be so easy). Most shops and restaurants in the cities will accept major international credit cards, and even some small shops in rural desert areas had more-or-less-functional credit card systems. But as a general rule, you’ll want to have cash on hand while bargaining in medinas and while traveling through small towns or in the desert. Plan ahead to find an ATM while in one of the bigger cities. Just as Morocco can be as budget-friendly as you’d like it to be, it can also cost a small fortune if you’re willing to spend it. But what I’ve found is that you can experience Morocco with all its beautiful accommodations, delicious foods, and breathtaking scenery within a reasonable budget. Luxurious riads (like the ones linked above) with breakfast included can be as little as 50 USD/night — and split between two people, and that’s completely doable on a budget. Food is relatively inexpensive and is delicious almost everywhere, so it’s a win-win. Expect to pay about $5-7 for a sit-down restaurant meal, or $2-3 for something more like a street food meal (think: kabobs, pita pocket sandwiches, etc.). If you’re on a budget, I recommend saving your food splurges for the fancy, world-renowned restaurants in Marrakech. I rarely travel with tour companies, but I know that my Morocco experience wouldn’t have been half as rewarding if it weren’t for my tour company. Although I am so grateful that Best Travel Morocco hosted me on this Morocco adventure, I will only ever give you my fully honest opinions. So trust me when I say that I’d recommend them as tour guides to even my closest friends and family. My favorite thing about this company is that they specialize in private bespoke tours, meaning every detail is catered to your preferences, budget, and travel style. Their goal is to create a Morocco adventure that is best for you, while ensuring that you have an authentic, culturally-enlightening experience. So, you won’t feel like you’re being dragged around from tourist trap to tourist trap. I learned more of the nuances of Moroccan history and culture (such as Casablanca’s Hassan II Mosque controversy or the courtship rituals within Berber communities) than I ever would have on my own. I had a constant source of information for the random questions that would pop into my head throughout the day (what bird/fruit/smell is that?) or for changes I wanted to make to the itinerary. I’d often show Amed (my guide) a photo of someplace from Instagram and he’d know where it was, how to get there, and a nearby hotel where he could reserve a room. The icing on the cake is that having Amed (who hosts tours, runs the company, speaks six languages, and is a wealth of Moroccan knowledge) and Hassan (who will likely be your driver & comedic relief) as guides was basically like traveling with friends. They kept our group laughing the entire trip, discussed life and religion and politics and wedding plans with us, and were a huge factor in how much we all loved our time in Morocco. Morocco is huge and complex and there is so much to see. Likely, you don’t have several months to figure out how to navigate it all properly (if you do, power to you). Do yourself a favor and hire a company like Best Travel Morocco to eliminate the stress make the most out of your limited time. Morocco is the most stunningly diverse country I’ve ever had the privilege to explore. It hasn’t even been two months since I left Morocco, and I’m already itching to return. I hope you’ll add Morocco to your bucket list (if it isn’t on there already), and start planning your next greatest adventure! Any questions about traveling to Morocco? Let me know in the comments below!